The SRON space research institute, Leiden University and the TU Delft are appointing six researchers to jointly carry out space research. The research will focus on exoplanets, the evolution of structure in the Universe and technology for developing new pioneering space instruments. These appointments are the first step in the intensive scientific and technological collaboration that is part of the move of SRON to the Leiden University Bio Science Campus (2021). The vacancies for the new positions are expected to be published early in 2019.
International research on exoplanets focuses increasingly on the 'characterisation' of small exoplanets, which may possibly include Earth-like planets. By appointing two new researchers - one in Leiden and one in Delft - the three partners are aiming to strengthen their position in this field of research. In concrete terms they aim to play an important role in the use of planned space telescopes and the development of future international exoplanet missions. New optical systems will be required for this research. SRON is already contributing to the European Plato and Ariel exoplanet missions. How do small and large structures in the Universe originate? How are stellar galaxies formed? How does a super-heavy black hole impact the physics of the surrounding galaxy? SRON is a partner in four space missions that may provide some answers to these questions: the Xrism and Athena X-ray telescopes, the European-Japanese Spica infrared mission and Lisa, the European gravitational wave detector. 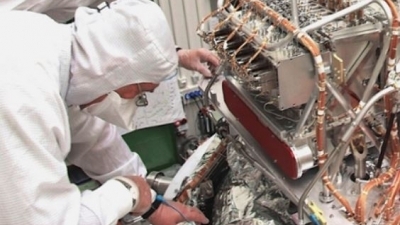 Two astronomers in Leiden will be examining the observations; in Delft an experimental astronomer will work on developing a new generation of advanced space cameras. And lastly, a researcher in Delft will focus on the development of technology for smallsats, small scientific satellites. Smallsats will probably make an important contribution to research from space within ten years, particularly research on the Earth's atmosphere. The expectation is that they will be able to chart the characteristics of aerosols (dust and minute particles in the atmosphere) very precisely. This is extremely important for the research on climate development and to gain a better understanding of the effect ot aerosols on air quality.